Finger sprains are injuries to a joint that cause a stretch or tear in a ligament. Ligaments are resilient bands of tissue connecting one bone to another. Such sprains are common in a wide variety of sports including football, cricket, and handball. Such sprains include metacarpophalangeal and interphalangeal sprains, Boutonniere deformity, and mallet finger. The fingers of the hand are composed of a number of joints, which are required to allow for the fine motor control of the fingers. 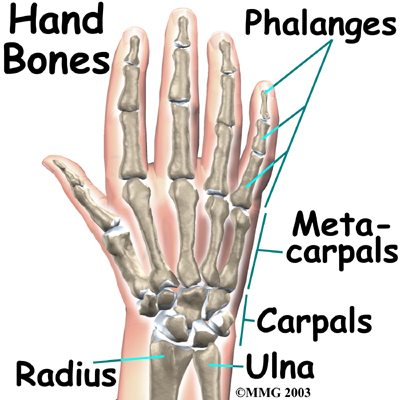 The metacarpophalangeal (MCP) (knuckle) joints are condyloid joints, each of which is enclosed in a capsule that is reinforced by strong collateral ligaments. The carpometacarpal (CM) joint of the thumb is a saddle joint, and the carpometacarpal (CM) joints of the fingers are plane joints. The intermetacarpal (IM) joints are also plane joints, and both the CM and IM joints are surrounded by a joint capsule. The interphalangeal (IP) joints, both distal (DIP) and proximal (PIP), are hinge joints. Injuries to the proximal interphalangeal (PIP) joint (the middle joint of the finger) are most common, and may result when the joint is straightened too far, (hyperextension). This can cause rupture or tearing of the volar plate, a ligament connecting the proximal and middle phalages to the collateral ligaments found on either side of the PIP joint. Blow to the hand at the region of the joint. Hyperextension of the joint, damaging the volar plate ligament. Collateral ligaments overstretched in a side to side displacement. Pain and tenderness in the finger. Pain when moving the finger joint. Swelling of the PIP finger joint, with the deformity in the case of joint displacement. Should a deformity associated with finger sprain become chronic, the chances for surgical correction are reduced. Potential for permanent functional deficit in the injured finger exists. Most finger sprain injuries, depending on severity, will be splinted or buddy taped to neighbouring digits in order to immobilise the area of trauma. Finger strains tend to be unforeseen and unpreventable injuries, though proper sports technique and equipment may reduce the likelihood of some sprains. Strengthening and mobility exercises for the fingers may be undertaken following initial healing. Full recovery and restoration of function in the injured finger is likely in most cases of finger sprains. Call (+65) 6471 2674 (24 Hour) to make an appointment to treat your finger sprain today.